Andrzej Sapkowski, writer of The Witcher series, admires the adaptation but isn't a video game fan. Andrzej Sapkowski isn't what anyone would call a gamer; Polish fantasy author Sapkowski has read a few gaming magazines, but that's about it. His Witcher series has done very well for gaming studio CD Projekt Red, but Sapkowski says he doesn't even feel like a co-author of the game. While Sapkowski admires the games and thinks their success is well deserved, he doesn't consider them sequels or alternative versions of the Geralt tales; just adaptations containing elements of his work. "The visual effect [of a game] will be stunning," Sapkowski says, "the players delighted - some might even consider it to be better and easier digestible than the original book .... Some will never even reach for the original book; as for them, the game will be enough." But Sapkowski believes the book - the original, in other words - takes precedence over what is, ultimately, a copy. "Without the book the adaptation would not exist at all," Sapkowski says. It's probably not a good idea to ask him to create tie-in content for the Witcher games. "To me as a writer," Sapkowski says, "the idea to write 'adjuvant content' and create something 'complementary' to a game or a comic is an absolute pinnacle of idiocy." 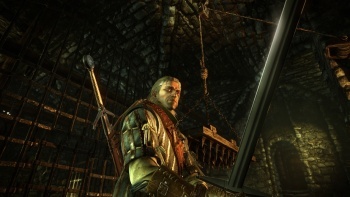 CD Projekt Red studio head Adam Badowski acknowledged the distinct difference between Sapkowski's books and the game adaptations, agreeing that there was no way the fantasy author would look to a video game for writing inspiration. "We have Mr. Sapkowsk's blessing and what we create is in line with his vision of the world," said Badowski, "no matter how the saga will evolve ... We just have to carefully and diligently do our thing."